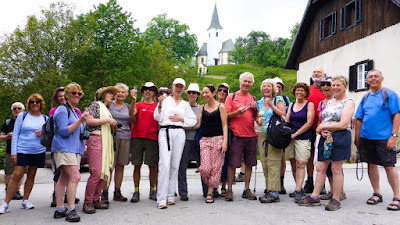 A tour with singing, visiting places of interest and beauty in Slovenia, meeting local singers and choirs, with short walks, meals with drinking songs, and friendship. 21 singers are joining us from our Lakeland Voice choirs and from further afield - including all of the four nations of the British Isles: Scotland, Ireland, Wales and England. 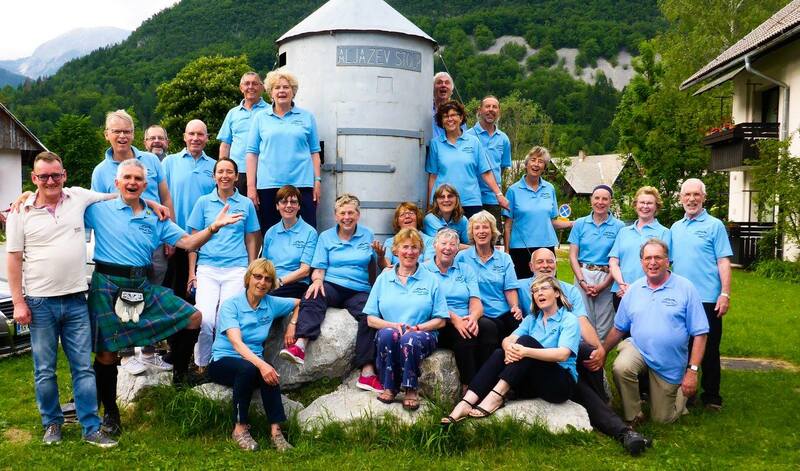 Most of all, we look forward to singing with our friends from Slovenia (including those we haven't met yet) who will join us at events while we are in this fabulous country famous for the beauty of its landscape, the quality of its singing, and the hospitality of its people. 19:30 Evening meal at Povsin tourist farm, Selo pri Bledu 22, Bled, Slovenia 00386.45767630 – followed by singing. 11:30 – Singing at opening of Wildflower festival in Bohinjska Bistrica at the cultural centre. Then Stara Fuzina – singing walk to the Koca na Voja mountain hut & waterfalls in Voje valley, singing among the wild alpine flowers with refreshment in the mountain huts. 11:31 Bled Jezeru station - all aboard the south bound train on the Soča valley railway to Kanal arriving 12:41– singing on train and in stations – and in the town of Kanal, hosted by Miran Ipavec. 19:00 Begunje concert in hilltop church at St Peter’s alongside Tirglav Lesce-Bled male voice choir – followed by evening meal in nearby mountain hut - hosted by Sašo Gašperin. 20:00 Concert with the Franc Urbanc male voice choir in Gorjuse hosted by Gospoda Franka Pavicic Sodja. Late morning - singing walk round Lake Bled, and rowing to the island to sing in The Pilgrimage Church of the Assumption of Maria. 20:00 Concert with three other Slovenian choirs in Bohinjska Češnjica - in the Fire Station hosted by Gospoda Franka Pavicic Sodja. 11:00 concert in Ljubljana Waldorf school. Plus - short informal lunchtime farewell to Slovenia singing under the Preseren statue in the centre of city before we fly home. 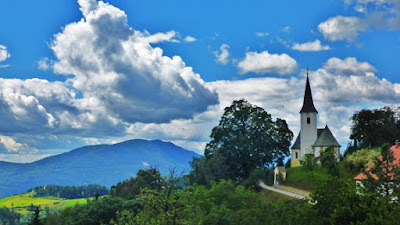 My love of Slovenia started when Sedbergh, the town where I live, became twinned with Zreče in Slovenia. The BBC made a film about it: "The town that wants a twin" showing how the policman stayed with our policeman, the baker with the baker, the post mistress with our postie - and of course the singers sang with ours. Since we were twinned in 2005 we have had over 30 exchanges between singers - and also with town bands, school students, football teams and soon even a Bridge card playing society with ours in Sedbergh. You can read about the twinning exchanges on http://sedberghinternational.blogspot.com/ - look under music for the singing exchanges organised by Lakeland Voice - or join us on any of our tours of Slovenia or here when we welcome choirs from Slovenia to visit and sing with our singers - with workshops, pub singing, concerts, walks and melodious international conviviality! Lep pozdrav iz Sedbergha in upam se vidimo kmalu.